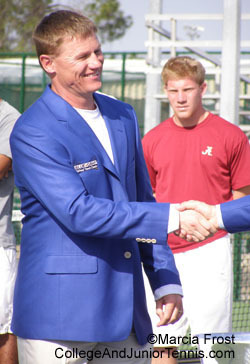 Last year's Blue Gray Collegiate Tennis Classic was a great experience for me and I was thrilled to be invited back this year to experience some of the Southern hospitality that players and coaches have been raving about for 60 years. There is really nothing that you can compare the Blue Gray event to. 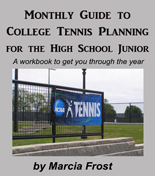 It is the second oldest collegiate tournament in the country (the NCAAs is the first -- and only by three years). It features 16 teams from around the country competing for the entire community of Montgomery, Alabama. From housing for each player, to a banquet and daily attendance, the entire city comes together for the Blue Gray. 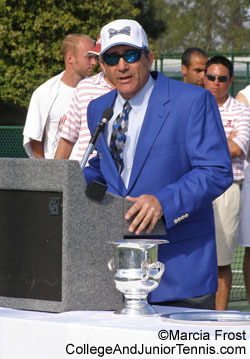 And for the tournament's 60th anniversary, there was perfect weather and record-breaking crowds. The Blue Gray Classic has always been about sportsmanship even more than ranking. 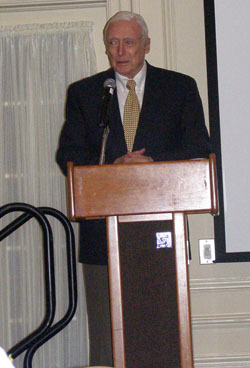 Most of the teams are consistently invited back year after year (Notre Dame's Bob Bayliss has brought 18 teams there). The teams ranged from the fourth-ranked Tennesee to the unranked Hawaii, who were making their first appearance. Much like the NCAAs, there are 16 teams with matches played to four team points, but the Blue Gray allows for consolation playoffs so everyone is around for at least three days. The night before play begins, players and coaches are treated to a steak banquet, donated by the Wilson family, who also own the Wynn Lakes Country Club that holds the dinner. In addition to the great food, it is the time the Hall of Fame receives its annual inductee. 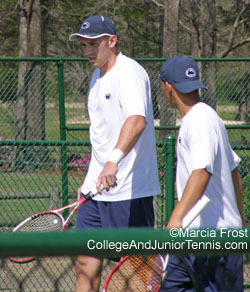 This year it was Wade Herron (right) who played in the very first event for Tulane, who joined the likes of James Blake, Mahesh Bhupathi, Peter Fleming and Donald Dell -- all of whom played this tournament -- as a Hall of Famer. 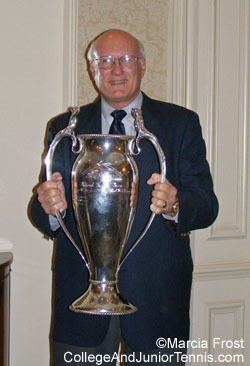 Also honored was Dr. Terry Treadwell, a former player who ran this event for 10 years. He was given the Jim Wilson Giving With Grace Award. I did not get to see most of the early event as I went down to Mobile for the Spring Nationals, but I was able to catch all of the thrilling final between Tennessee and Alabama. It was exciting for the spectators to have a home state team in the final and the Crimson Tide were certainly the favorites. 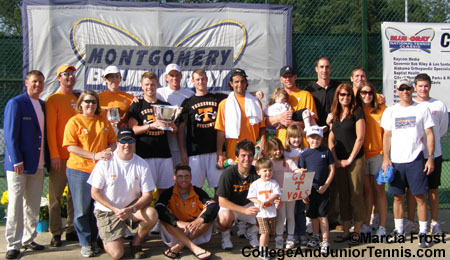 But the Tennessee host families (each team had at least four host families) were there to support the Volunteers. 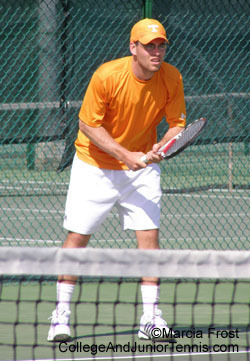 Tennessee took a tight doubles point after the teams split the first two matches. The Crimson Tide came back quickly to take the first two points with Dan Buikema's defeat of Matt Brewer and Michael Jung's win over Christopher Williams. Alabama's 2-1 lead wouldn't last, though. 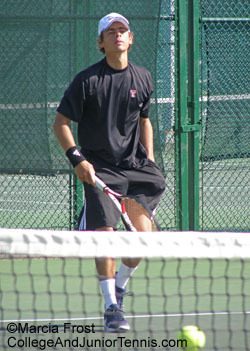 The Volunteers had the next two with wins -- one from JP Smith at No. 1 singles and Boris Conkic at two. 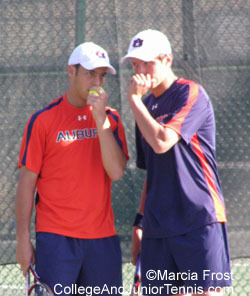 Everyone then focused on the fifth position where, at 5-4, it looked like Billy Mertz might pull it to a third set and keep Alabama in it. 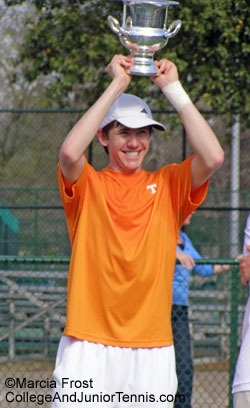 It wasn't to happen as Christian Hansen took the set and a 4-2 championship for Tennessee. 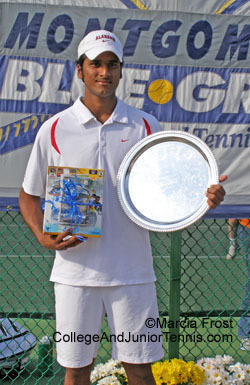 The other schools competing in this year's Blue Gray Classic and enjoying the excitement of Montgomery as it celebrated college tennis were Boise State, Fresno State, Middle Tennessee State, Mississippi State, Notre Dame, Oklahoma, Oklahoma State, Penn State, Texas Tech, Virginia Commonwealth, William & Mary, Wisconsin and Auburn. And they all agreed with the words echoed by Alabama Coach Billy Pate, who started coming as a player for Mississippi State in '87, "The Blue Gray hospitality is second to none. This tournament has always gone out of its way and that's what makes it so unique. There's really nothing else like it."